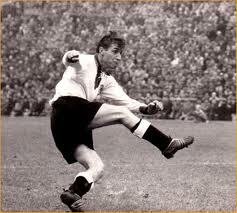 On 31 October 1920, Kaiserslautern and West Germany legend Fritz Walter was born. Gifted with a remarkable combination of ball control, vision, and agility, Walter, who was born in Kaiserslautern, spent his entire career with his hometown club. He made his first-team debut for them at the age of 17, but World War II interrupted his career for several years. Play resumed in 1945 and Walter soon guided the team to their first major silverware, winning league titles in 1951 and 1953. He retired in 1959 with a record of 380 goals in 411 league appearances. In 1985, the club renamed their stadium after him. His greatest achievement, however, came with the West German national team in 1954, when he captained them to their first World Cup trophy, beating Hungary 3-2 in a final known as "the Miracle of Bern" (Hungary were up 0-2 after only 8 minutes before West Germany rallied for the win). Despite the wartime hiatus, Walter earned 61 caps between 1940 and 1958, scoring 33 goals. When UEFA, in preparation for their fiftieth anniversary in 2004, asked each member nation to name their one greatest player--the Golden Players--of the previous fifty years, Germany selected Walter. He passed away in June 2002 at the age of 81. 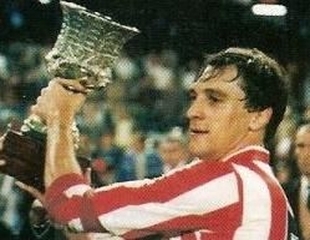 On 30 October 1985, Atlético Madrid won the Supercopa de España despite losing to Barcelona. The competition, played over two legs, matched Atlético, the previous season's Copa del Rey winners, against Barcelona, the reigning league champions. They met in Madrid for the first leg on 9 October, with Barcelona taking a 1-0 lead thanks to a 31st-minute goal from Paco Clos. But Atlético roared back with strikes from Mario Cabrera (40'), Miguel Ángel Ruiz (pictured) (52'), and Jorge da Silva (76') to end the day as 3-1 winners (video below). Barcelona hosted the second leg at Camp Nou three weeks later and again took a 1-0 lead, this time with a goal from center back José Alexanko in the 32nd minute. But Atlético were content to defend their aggregate lead and Barça were unable to find another. So despite winning the second leg 1-0, they lost 3-2 on aggregate. Since then, the two teams have met four more times in the Supercopa (1991, 1992, 1996, and 2013), with Barcelona winning all four. 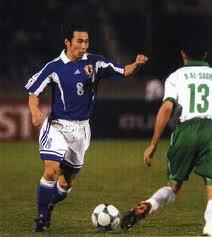 On 29 October 2000, Japan won their second Asian Cup, beating Saudi Arabia in a rematch of the 1992 final. Saudi Arabia were the defending champions, having won the 1996 tournament in the United Arab Emirates. They stumbled in their opening match, losing to Japan 1-4, but they rallied to reach the knockout rounds where they advanced with narrow wins over Kuwait and South Korea. Japan, meanwhile, won their group, then reached the final with wins over Iraq and Indonesia. Playing before a crowd of 47,000 at Beirut's Sports City Stadium, Saudi Arabia had a chance to take an early lead with a penalty kick, bit the shot went wide. Shortly afterward, Japanese midfielder Shigeyoshi Mochizuki (pictured) scored the game's only goal in the 30th minute with a volley off a free kick. It gave his team a 1-0 victory, the same scoreline from their win over Saudi Arabia in 1992. Japan repeated as champions in 2004 and won a third cup in 2011. On 28 October 2007, Steven Gerrard made his 400th appearance for Liverpool, scoring in a 1-1 draw with Arsenal. Born in the nearby Merseyside village of Whiston, Gerrard joined Liverpool as a youth player in 1987 and signed a professional contract with them ten years later. He made debuted with the first team on 29 November 1998 and made a total of thirteen appearances that season across all competitions. By the next season, he had secured a regular starting spot in central midfield, making 31 appearances in 1999-2000 and 50 in 2000-01. In the latter, he also scored a total of 10 goals as Liverpool won a treble consisting of the UEFA Cup, FA Cup, and League Cup. He became the team captain in 2003 and additional trophies followed, including the dramatic victory over AC Milan in the 2005 Champions League in which Gerrard scored Liverpool's first goal to start a comeback from 3-0 down to win on penalties, 3-3 (2-3). For his 400th club appearance, Liverpool hosted Arsenal at Anfield, where Gerrard's 7th-minute free kick from the edge of the box (pictured) put his team up 1-0. Arsenal's Cesc Fabregas delivered an equalizer in the 80th minute to finish the day at 1-1. On 27 October 2004, São Caetano defender Serginho suffered a cardiac arrest during a match against São Paulo and died later that day. He was 30 years old. 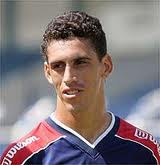 The center back, whose real name was Paulo Sérgio Oliveira da Silva, had joined São Caetano in 1999 after spending the previous four years at six different clubs. While there, according to goalkeeper Silvio Luiz, team doctors discovered that Serginho had an enlarged heart which put him at risk for potential cardiac problems. But, again according to Luiz, they thought the risks of an incident were "less than one percent." In the 38th week of the season, São Caetano was away at São Paulo when Serginho suffered a seizure and collapsed in the 60th minute. Physicians from both teams attempted to revive him, but with no success. He was rushed to the hospital, where he was later pronounced dead. The match was abandoned with a score of 0-0, but the remaining 30 minutes were played on 3 November, with São Caetano winning 4-2. They were later docked 24 points for allowing Serginho to play with a known heart condition, dropping them from fifth to eighteenth in the final table. On 26 October 1988, Nacional won their third Copa Libertadores, beating Newell's Old Boys 3-0 in extra time of the final's second leg. 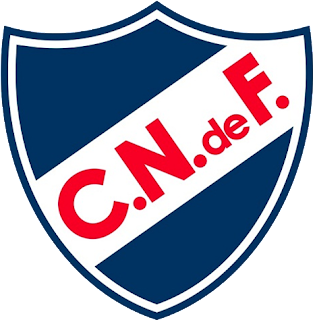 Nacional were a very experienced tournament side, having finished as runners-up in 1964, 1967, and 1969 before eventually lifting the cup in 1971, then again in 1980. 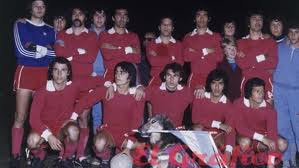 Old Boys, on the other hand, were in the final for the first time after their title-winning season in the 1987-88 Argentinian Premier División. Old Boys took the first leg, winning 1-0 at home on 19 October with a 60th-minute goal from forward Jorge Luis Gabrich. 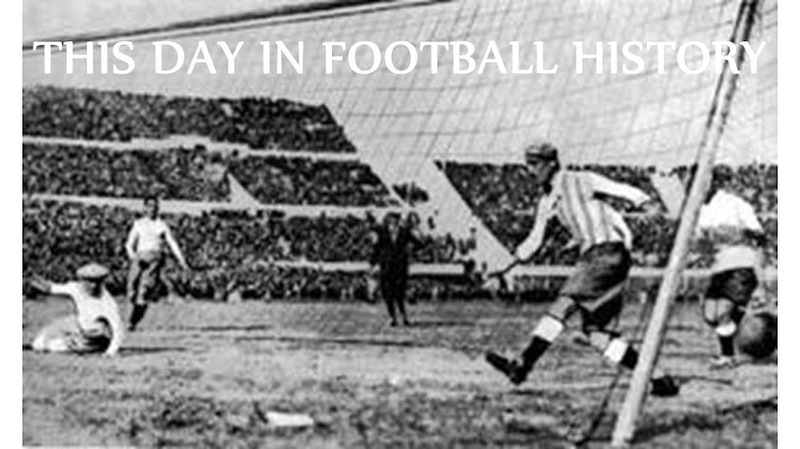 The teams then reconvened in Montevideo for the second leg, with a crowd of 75,000 gathering for the occasion. 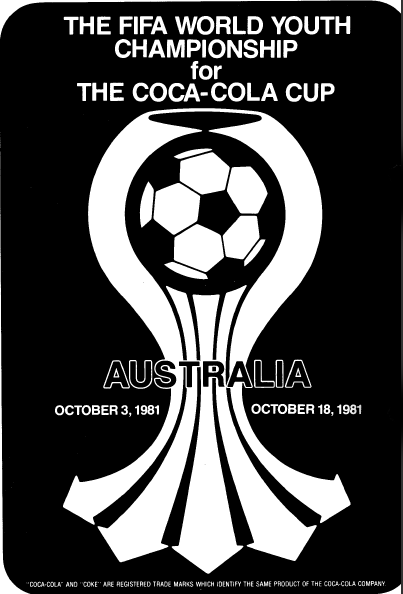 The organizers instituted a new rule for the 1988 tournament; like the previous finals, it was determined on points, but whereas earlier tournaments went to a playoff when the teams were level on points after two legs, the 1988 edition went to extra time. At the end of extra time, the winner was decided by goal differential with a penalty shootout to follow if needed. As it turned out, it wasn't. Nacional took a 2-0 lead into the break with goals from Ernesto Vargas (13') and Santiago Ostolaza (36'), then added a third from Hugo de León in the 78th minute to all but seal the win on goal differential, though the teams still needed to play through extra time. Tempers flared in the 115th minute, with the referee ejecting a player from each side as Nacional held on for the title. Despite their history of success, Nacional have not returned to the final since. Old Boys reached it again in 1992, but lost to São Paulo. On 25 October 1998, the Chicago Fire, playing in their first season, won the MLS Cup over two-time champions DC United. Chicago had compiled an impressive record of 20 wins and 12 losses to reach 56 points on the season, third-best in the league behind the LA Galaxy (68) and DC United (58). In the playoffs, they beat the Colorado Rapids in the conference semifinals, then advanced over the Galaxy in a conference final shootout to reach the MLS Cup. The final was played at the Rose Bowl in Pasadena, where Chicago faced DC United, winners of the first two MLS Cups in 1996 and 1997. DC boasted one of the league's most potent attacks. Featuring forwards Roy Lassiter and Jaime Moreno, DC had scored a total of 81 goals, second only to the Galaxy's 85. Chicago, however, managed to hold DC scoreless in the final while getting two goals of their own from striker Jerzy Podbrożny (29') and midfielder Diego Gutiérrez (45'). Both goals were assisted by midfielder Piotr Nowak (pictured), was was named the game's most valuable player. It remains Chicago's only MLS Cup, though they finished as runners-up in 2000 and 2003. DC went on to win it again in 1999 and 2004. 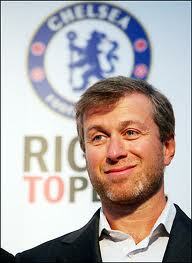 On 24 October 1966, Chelsea owner Roman Abramovich was born in the city of Saratov in southern Russia. Currently one of the richest men in the world, he has spurred Chelsea to a massive haul of silverware including multiple league titles and the Champions League trophy. Abramovich accumulated his wealth quickly, though he has been accused of using methods of questionable legality. For example, while still serving in the Soviet Army, he made money by selling allegedly stolen gasoline. By 1995, however, he, along with a partner, had acquired a controlling interest in a large Russsian oil company, paying $100 million. In 2003, he bought Chelsea from then-owner Ken Bates. He paid £140 million for the club, who at the time were saddled with debt, and quickly steered them to back-to-back Premier League titles in 2005 and 2006--their first league titles since 1955. Chelsea have had twelve different (non-caretaker) managers under Abramovich, including Claudio Ranieri, José Mourinho (twice), Guus Hiddink, Carlo Ancelotti, and current boss Antonio Conte. Throughout, Chelsea have won five league titles (2005, 2006, 2010, 2015, and 2017), four FA Cups (2007, 2009, 2010, 2012), and the Champions League (2012). 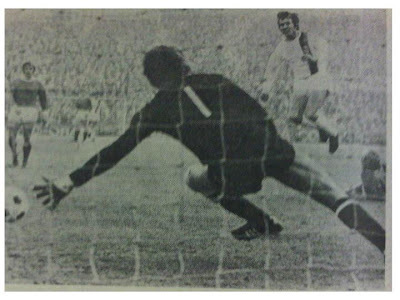 On 23 October 1971, Bundesliga leaders Schalke visited defending champions Borussia Mönchengladbach and were crushed, 7-0. Gladbach had won the league the previous two seasons, but started the day five points behind Schalke. Schalke's run to the top was driven by their strong defense, who had surrendered only three goals so far that season and had just completed their seventh straight clean sheet. But it did not take long for Gladbach to end that streak, as striker Jupp Heynkes scored after only four minutes (pictured). It was the start of a long day for Schalke keeper Norbert Nigbur, who picked the ball out of his net another four times in the first half alone after goals from Günter Netzer (5'), Hartwig Bleidick (23'), another from Heynckes (29'), and one from Ulrik Le Fevre (36'). With the margin stretched to 5-0 at the break, the match was effectively over as a contest, but Gladbach were not done. In the 52nd minute, Le Fevre scored another by juggling the ball over two Schalke defenders before slamming the ball into the net with a right-footed volley. Netzer then completed the rout with a 64th-minute strike to extend the final margin to 7-0. As impressive as the victory was, it fell short of the record at the time, set by Gladbach with an 11-0 win over Schalke in 1967 (they beat their own record in 1978 by beating Borussia Dortmund 12-0). Schalke went on to finish as runners-up to Bayern Munich in the league that season, while Gladbach finished in third. On 22 October 1899, A Swiss businessman in Spain placed a notice in a local newspaper to drum up interest in forming a new club. It went on to become known as FC Barcelona. The businessman, Hans-Max Gamper, who had once captained FC Basel, had founded FC Zürich three years earlier. His trip to Barcelona in 1898 was originally intended as a short visit, but he fell in love with the city and decided to remain (eventually adopting the Catalan form of his name, Joan Gamper). In order to continue playing football, he submitted a notice to the local paper, Los Deportes. Translated into English, the notice read "Our friend and partner, Mr. Kans Kamper, from the Foot-Vall Section of the 'Sociedad Deportes' and former Swiss champion, wishing to organize some matches in Barcelona, requests that everyone who likes this sport contact him, come to this office Tuesday and Friday nights from 9 to 11." The notice generated a positive response, leading to the first meeting of FC Barcelona on 29 November. Gamper was the club's first captain, making 44 appearances and scoring 100 goals between 1899 and 1903. He later served as club president five different times, for a total of 25 years, during which Barça won the Copa del Rey three times. They have since become one of the world's most successful clubs, with 21 league titles and four European Cup/Champions League trophies. 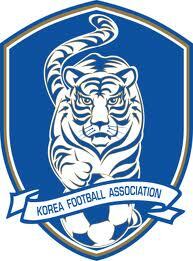 On 21 October 1960, South Korea won their second consecutive Asian Cup, beating China 1-0. It was the second edition of the tournament, with South Korea returning as defending champions after winning it in 1956. They were joined in 1960 by China, Vietnam, and Israel, the 1956 runners-up. Each team played the other team once, with the standings decided by points. Wins were worth two points and draws one. South Korea opened the tournament with a powerful statement of intent by beating Vietnam 5-1, followed by a 3-0 win over Israel. They entered their last match in the top spot, two points clear of Israel and China (Vietnam was at the bottom). Israel, like South Korea, had only one match left, but China had two, including their game against South Korea. So while the Koreans needed only a draw to guarantee that they would finish over Israel, they needed a win to ensure a higher finish than China. And they got it, narrowly. Playing before their own supporters at the Hyochang Stadium in Seoul, forward Moon Jung-Sik scored the day's only goal in the 54th minute. Israel again finished as runners-up, beating China 1-0 two days later in the final match of the tournament. 20 October 1996 - That's Not Really A Cup, Though, Now Is It? 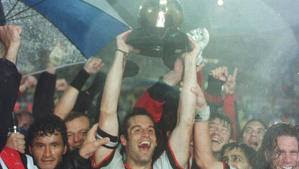 On 20 October 1996, DC United rallied from a two-goal deficit to win the first MLS Cup over the Los Angeles Galaxy. LA and DC finished with the second- and third-best records, respectively, in that first MLS season, behind the Tampa Bay Mutiny. In the playoffs, the Galaxy advanced with wins over the San Jose Clash and the Kansas City Wiz, while DC reached the final by beating the NY/NJ MetroStars and Tampa Bay. They met at a rainy Foxboro Stadium in Massachusetts, where LA striker Eduardo Hurtado gave his team an early lead with a 4th-minute goal. His teammate, midfielder Chris Armas then doubled the lead in the 56th minute with a goal that appeared to secure the trophy for the Galaxy. But DC came storming back late in the second half, getting scores from substitute midfielders Tony Sanneh (72') and Shawn Medved (81') to send the match into extra time, where a 94th-minute goal from United defender Eddie Pope sealed the comeback victory. DC went on to appear in the next three MLS Cup finals, repeating as champions in 1997 and winning it for a third time in a 1999 rematch with the Galaxy. On 19 October 1974, Independiente won their third straight Copa Libertadores--and fifth overall--beating São Paulo in a playoff, 1-0. Going into the final, Independiente were already the tournament's most successful team, winning it in 1964, 1965, 1972, and 1973, while São Paulo were in the final for the first time. But they split the two legs, with São Paulo winning 2-1 in Brazil and Independiente taking the honors in Argentina, 2-0. Level on points, they met at the Estadio Nacional in Santiago for a playoff. There, 60,000 people looked on as Independiente left back Ricardo Pavoni scored in the 37th minute. It was the only goal of the match, giving Independiente the win, their fifth title in five final appearances for the Argentinians. They continued their perfect record in the final, winning it again in 1975 and 1984. São Paulo, meanwhile, reached the final five more times, lifting the cup in 1992, 1993, and 2005. On 18 October 1981, West Germany won the U-20 World Cup, beating Qatar 4-0. It was the first time in the tournament for both teams, who failed to qualify for the two previous editions. Qatar were the surprise of the tournament, beating Poland in the opening match of the group stage (followed by a 1-1 draw with the United States and a 1-0 loss to Uruguay), then beating Brazil (3-2) and England (2-1) in the knockout rounds to reach the final. There, they faced a West German team that won their group with wins over Mexico (1-0) and Spain (4-2) (as well as a 2-1 loss to Egypt), then advanced to the final by beating hosts Australia (1-0) and Romania (1-0 (aet)). The met at the Cricket Ground in Sydney, where West German defender Ralf Loose opened the scoring in the 26th minute. Striker Roland Wohlfarth doubled the lead in the 40th minute, before Loose completed his brace with a 66th-minute goal. Holger Anthes then capped the victory with an 86th-minute shot to set the final margin at 4-0. Of the three scorers, only Wohlfarth would later play for the full national team, making two appearances between 1986 and 1989. The only other player to earn a senior cap was midfielder Michael Zorc, with seven. On 17 October 1990, Ireland beat Turkey in a European qualifier to launch their record unbeaten streak. But it didn't get them to the Euros. It was the first match day of qualifying in Group 7, with Ireland hosting Turkey in Dublin. 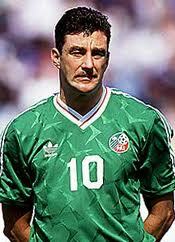 Playing before a crowd of 46,000 at Lansdowne Road, the Irish took an early lead with a goal from striker John Aldridge (pictured) in the 15th minute. Center back David O'Leary added another in the 40th minute to send Ireland into the break with a 2-0 lead. In the second half, Aldridge scored twice more (58', 73'), with a goal from striker Niall Quinn in between (60') to raise the final score to a dominant 5-0 for the hosts. Ireland followed the win by drawing with England (1-1) and Poland (0-0), with the combination leaving them one point short of qualification for Euro 1992. They continued their unbeaten run for a record total of 16 matches before eventually losing to Spain in their last qualifier for the 1994 World Cup. They did qualify for the World Cup, though, and advanced to the Round of 16. On 16 October 1968, Estudiantes won the Intercontinental Cup, beating Manchester United over a contentious two-legged final. By winning the previous season's Copa Libertadores, Estudiantes earned the right to face Manchester United, the reigning European Cup champions. They met for the first leg in Buenos Aires on 25 September, with the hosts eking out a narrow 1-0 victory in a match that saw United midfielder Nobby Stiles get ejected and striker Bobby Charlton receive a blow to the head that required stitches. 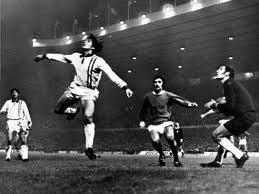 Despite that result, United were favorites going into the second leg at Old Trafford three weeks later, where a crowd of 63,500 gathered for the event. But they quickly fell behind when Estudiantes forward Juan Ramón Verón scored in just the seventh minute. 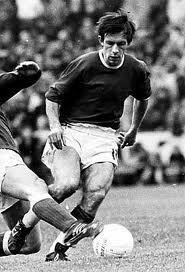 The situation grew worse for United when striker Denis Law received an injury and had to come off in the 43rd minute, replaced by Carlo Santori. Tempers flared in the second half as both teams had a player ejected--George Best for United and José Medina for Estudiantes--in the 88th minute. Willie Morgan drew the home team level in the 89th minute, but they could not find another goal and Estudiantes won on points. On 15 October 1887, Preston North End delivered the biggest beating in English football history, crushing Hyde FC 26-0 in the FA Cup. Although they had been playing football for only nine years, Preston had already established themselves as a rising power, reaching the FA Cup semifinals the previous season. When the returned to the tournament in the 1887-88 season, they met Hyde at Deepdale in the first round and proceeded to win 26-0. It remains the biggest margin of victory in English football (but still behind the British record, set by Arbroath's 36-0 Scottish Cup win over Bon Accord in 1885). 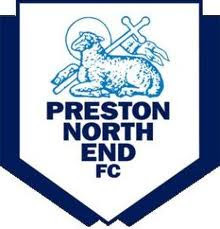 Preston advanced all the way to the final before losing to West Brom, but won the tournament the following season as part of the first English FA Cup and league Double. They repeated as league champions in 1990 and finished as runners-up in 1991, 1992, and 1993. Labels: Hyde FC, Preston North End F.C. 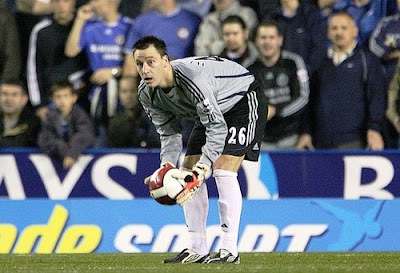 On 14 October 2006, Chelsea needed three goalkeepers to get through their match against Reading, with captain John Terry pulling on the gloves for a bit. Playing in a league game at Reading's Madjeski Stadium, Chelsea lost starting goalkeeper Petr Cech after just 20 seconds. Diving to make a save at the feet of Reading's Stephen Hunt, Cech took a blow to the head that fractured his skull. He left the pitch on a stretcher and was replaced by substitute keeper Carlo Cudicini. Reading tested Cuducini, but it was Chelsea who took the lead after Reading defender Ivar Ingemarsson put the ball in his net off a Frank Lampard free kick in the 45th minute. In the second half, both teams went down to 10 men as Chelsea's John Obi Mikel (in the 62nd minute) and Reading substitute André Bikey (in the 83rd) both received second yellow cards and were sent off. Then, shortly before the final whistle, Cuducini collided with Reading defender Ibrahima Sonko and lost consciousness. Having already used all three substitutes, manager José Mourinho sent John Terry into goal. With only moments left, Terry had little to do to see out the 0-1 win. On 13 October 1977, striker Antonio Di Natale was born in Naples. He went on to become one of Italy's top scorers, leading Serie A in back-to-back seasons. He started his professional career in 1996 with Empoli, at that time in Serie B, but made only one appearance in that first season, then spent the next two on loan. In 1999, he finally broke into Empoli's first team, making 30 appearances in all competitions and scoring seven goals. His best season there was 2001-02, when his 16 league goals helped them get promoted to Serie A and earned Di Natale his first cap with Italy. After the 2003-04 season, with Empoli relegated back to Serie B, he stayed in the top flight by moving to Udinese and immediately helped them to a fourth-place finish. His breakout season came in 2009-10, when he scored 29 goals to claim the Capocannoniere and the 2010 Italian Footballer of the Year award. He claimed the scoring title a second time in 2010-11 with 28 goals. He remained with Udinese until his retirement in 2016, scoring a total of 227 goals in 446 appearances for the club. On 12 October 1965, Chile beat Ecuador in a playoff to qualify for their first European World Cup. They were coming off their best showing in the tournament, finishing in third place as hosts in 1962. But they had never played in a World Cup hosted by a European country, withdrawing from Italy '34 and France '38 and failing to qualify for Switzerland '54 and Sweden '58. To reach England for the 1966 edition, they had to get through a CONMEBOL qualification group whose other members were Ecuador and Colombia. After four games each, Chile and Ecuador had identical records, with each having two wins, a draw, and a loss. Although Chile had a better goal differential and beat Ecuador 3-1 in the last scheduled match of the group, the rules ranked the teams by points only, forcing a decision through a playoff. The teams met in the neutral location of Lima, Peru, where Leonel Sánchez (pictured)--the hero of Chile's 1966 World Cup performance--opened the scoring in the 16th minute, followed by a goal from Rubén Marcos in the 40th minute to stake Chile to a 2-0 lead at the break. Ecuador finally managed to get on the scoreboard in the 89th minute, but it was nothing more than a consolation goal. The 2-1 win sent Chile to England, but they were unable to recapture their form from the previous tournament and were eliminated in the group stage. On 11 October 2011, a couple of Japanese players scored their first international goals as they handed Tajikistan a record loss. The occasion was a third-round match in Asian Football Confederation for the 2012 World Cup, with Japan hosting Tajikistan at Nagai Stadium in Osaka. Up to that point, all five games played earlier in the group had ended either 1-0 or 1-1, including two games each for Japan and Tajikistan, so nobody was quite prepared for what happened next. 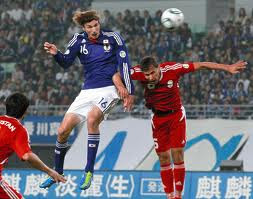 Striker Mike Havenaar (pictured), in second appearance for Japan and first start, scored the opener--his first for the national team--with an 11th-minute header. It was followed by goals from Shinji Okazaki (19'), Yuichi Komano (35', his first for Japan), and Shinji Kagawa (41') to stretch the lead to 4-0 at the break. In the second half, Havenaar again led off with a header (47'). Kengo Nakamura added one on the 56th minute before both Kagawa (68') and Okazaki (74') scored again. The final 8-0 margin set a new record low for Tajikistan, who proceeded to finish last in the group, eliminating them from qualification. Japan advanced to the fourth round, where they currently sit at the top of their group. As impressive as the win was for Japan, it fell far short of their record victory, a 15-0 win over the Philippines in 1967. 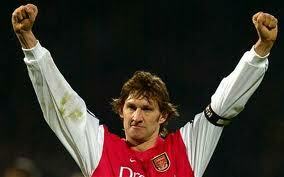 On 10 October 1966, Arsenal defender Tony Adams was born in Romford, England. He went on to become the team's most successful captain and also skippered the England national team. He spent his entire career at Arsenal, joining them as a youth player in 1980 and remaining there until his retirement in 2002. In all, he made a total of 672 appearances for them across all competitions. He received the captain's armband from manager George Graham in January 1988 and kept it for the next fourteen years. During that time, he led Arsenal to a collection of silverware that included the league title in 1989 and 1991, the 1993 FA Cup, and the 1994 Cup Winners' Cup. Then, in 1998, he guided them to a league and FA Cup Double, a feat they repeated in 2002. Adams also made 66 appearances for England between 1987 and 2000 and captained the team to the semifinals in Euro 96. On 9 October 1961, Gillingham made a tremendous effort to reach Barrow for a league match and, for their troubles, left with a 7-0 loss. The day started badly enough for Gillingham when their train to Barrow missed its connection in London. In an attempt to make it to the match on time, they chartered a plane to Blackpool, then took a set of cabs to Barrow's ground. When they finally arrived, it was well past the scheduled starting time, but the match went ahead. Due to the late start, and because Barrow did not have floodlights, darkness soon became an issue, forcing the referee to halt the match in the 76th minute. By that time, Gillingham were already down 7-0. Given the scoreline and the fact that the delay had been caused by Gillingham, the Football League allowed the result to stand. It was just one goal short of their record defeat, an 8-0 loss to Luton in 1929. Labels: Barrow AFC, Gillingham FC, Luton Town F.C. On 8 October 2011, South Africa played to a scoreless draw with Sierra Leone, thinking the result qualified them for the African Cup of Nations. They were wrong. It was the final match for both teams in Group G of the tournament's qualifying stage, with South Africa starting the day one point behind group leaders Niger, who were playing Egypt at the same time South Africa faced off against Sierra Leone. With the latter two locked in a scoreless draw midway through the second half, South Africa received news that Niger had fallen behind Egypt by the score of 3-0. If the scores held, South Africa and Niger would finish level on points, but South Africa would have a goal differential of +2 to Niger's -2. Content to play for the draw, South African boss Pitso Mosimane made a late substitution, bringing on a midfielder in place of a striker. And, when the match ended 0-0, the South Africans celebrated the result with a dance and a lap of honor before their exultant fans. What they failed to realize, however, was that goal differential did not serve as the tie-breaker. Instead, the rules of the tournament provided that teams level on points were to be ranked by their head-to-head record against each other. That metric favored Niger. South Africa lodged a protest, claiming that goal differential should have been the deciding factor, but later dropped their appeal. Niger advanced to the Cup, where they were eliminated in the group stage after losing all three matches. 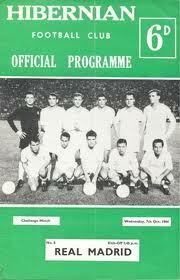 On 7 October 1964, Hibernian hosted Real Madrid in a friendly, beating the Spanish champions 2-0. Accepting an invitation from Hibs manager Jock Stein, Real Madrid arrived at Easter Road having won the last four La Liga titles and having finished as runners-up in the previous season's European Cup. Their line-up boasted a number of stars, none brighter than their prolific forward pairing of Ferenc Puskás and Francisco Gento. But they were up against a Hibs team that included six Scottish internationals, including forward Willie Hamilton. But it was Hibs' unheralded 19-year old midfielder Peter Cormack who scored the opening goal to put the hosts up 1-0. They then got a second, though reports disagree as to who scored it; some say it was forward Jim Scott, while others claim it was an own goal from Real Madrid left half Ignacio Zoco. Either way, it cemented a 2-0 victory for Hibs that saw the home supporters invade the pitch in celebration. Real Madrid went on to end the year with their fifth consecutive league title, while Hibs finished in their league's fourth-place spot. On 6 October 1987, Roald Jensen, widely considered Norway's greatest player, died while training with his old club, SK Brann. He was 44 years old. Nicknamed "Knicksen"( meaning "juggler") for his tremendous technical ability with the ball, Jensen joined Brann in 1956 as a youth player, then made his first-team debut in 1960 when he was 17 years old. He earned his first cap for the national team that same year. In his first three seasons with Brann, they won the league twice (1962 and 1963), but his fourth season ended in relegation, prompting his move to Scotland, where he turned professional and became Heart of Midlothian's player from outside the UK. He remained with Hearts for six seasons, then returned to Brann in 1971 and stayed until 1973, when a dispute with the team's manager led to Jensen's retirement in 1973 at the age of 30. He continued to be involved with the club, however, and was training with them when he collapsed and died. Three years after his death, the Norwegian football association honored Jensen with the creation of the Knicksen Award, given annually to the best player in Norway's top flight. In 1995, Brann further celebrated him by putting a statue of him outside their stadium. On 5 October 1973, striker Mario Kempes made his top-flight debut for Instituto de Córdoba in a 1-0 win over Newell's Old Boys. He went on to become one of Argentina's greatest players. 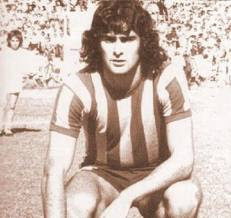 Nineteen years old at the time, Kempes had already spent three years with Instituto, helping them reach Argentina's Primera División for the 1973 season, the team's first time in the top flight. Kempes made thirteen appearances for them that season, scoring eleven goals, before moving in 1974 to Rosario Central, where he scored eighty-five goals in three seasons. That performance earned him a move to Spain to play for Valencia. He was the league's leading scorer in 1977 and 1978 and won his first silverware there, winning the 1970 Copa del Rey, the 1980 Cup Winners' Cup (though he missed the first kick in the final's penalty shootout), and the 1980 UEFA Super Cup. Despite those successes, Kempes is best known for leading Argentina to their first World Cup trophy in 1978. He was the tournament's top scorer with six goals, including two in Argentina's 3-1 win over the Netherlands in the final. He continued to play for several teams in Argentina and Europe until he called time on his career in 1996, then spent five years in management before retiring in 2001. Labels: 1978 World Cup, CA Newell's Old Boys, CA Rosario Central, Instituto Atlético Central Córdoba, Mario Kempes, Valencia C.F. On 4 October 1990, Peter Taylor, who won a league title and two European Cups as an assistant to Brian Clough, passed away while on holiday in Spain. He was 62. Although best known for his abilities as a manager and scout, Taylor enjoyed a lengthy playing career with Coventry City (1950-55), Middlesbrough (1955-61), and Port Vale (1961-62). Then, in 1962, he took his first managerial job as player-manager for Burton Albion and spent two seasons there before leaving to join Hartlepool as an assistant to his former Middlesbrough teammate, Brian Clough. Taylor and Clough spent ten of the next twelve seasons together, including six and a half years at Derby County where they won the league title in 1972. Their only time apart was from 1974 to 1976, when Taylor took charge of Brighton & Hove after Clough left for his ill-fated spell at Leeds United. They reunited in 1976, when Taylor joined Clough at Nottingham Forest and the pair proceeded to win two European Cups (1979, 1980). In 1982, Taylor left Clough and returned to Derby County, managing them for two seasons before retiring in 1984. During that second spell at Derby, Taylor signed winger John Robertson from Derby without telling Clough in advance. The signing created a rift between the two men, who never spoke to one another afterward, a fact deeply regretted by Clough after Taylor's death. In 2010, Derby County commemorated Taylor and Clough with a statue of the pair outside the ground. On 3 October 1984, the Chicago Sting won the North American Soccer League title over the Toronto Blizzard in a match that turned out to be the league's last. Established in 1968, the NASL grew to prominence in the 1970s due in large part to the signing of high-profile players like Pelé, Franz Beckenbauer, Johan Cruyff, and George Best and, by 1978, included a total of 24 teams across the United States and Canada. But the anticipated crowds failed to materialize and the team owners suffered substantial financial losses, resulting in several clubs folding or moving to the lower-tier (and less costly) Major Indoor Soccer League. At the start of the 1984 season, the NASL had dropped to only nine teams, four in the Eastern Division and five in the Western. Two teams from each division met in the playoffs, which consisted of a pair of semifinal matches, followed by a best-of-three final, with Chicago and Toronto advancing over their Western Division counterparts to set up an all-Eastern final. Chicago won the first leg in Toronto, 1-2, on 1 October, then won the second in Chicago two days later, 3-2, rendering the scheduled third match unnecessary. With the win, Chicago became only the second team (after the Cosmos) to win more than one NASL title. 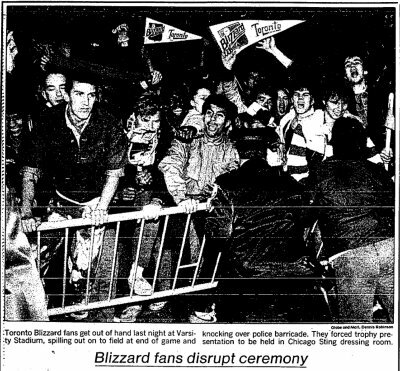 After Chicago's victory, Blizzard supporters knocked over a police barricade and invaded the pitch, forcing officials to hold the trophy ceremony in Chicago's locker room. The NASL intended to return for another season, but several more teams, including Chicago and New York, defected to the MISL. With only two clubs left, the NASL folded in early 1985. 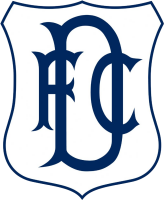 On 2 October 2010, Dundee beat Greenock Morton 2-1 to start a club-record 23-game unbeaten streak. Which left them in the exact same spot in the table they were in when they started it. It was the eighth matchday of the Scottish Division One season, which opened with Dundee in seventh place after an away loss to Cowdenbeath. They were hosting Morton at Dens Park, where a crowd of 4,068 turned up to see what turned out to be the start of a record run. Dundee took the lead in the 25th minute after the referee called a handball on Morton and Matt Lockwood converted the ensuing penalty. They failed to hold it to the break, however, as Peter Weatherson drew the visitors level with a goal off a corner kick in the 41st minute. But Dundee pulled back ahead for good in the 57th minute with Colin McMenamin scoring the match winner. They followed the result by going undefeated in their next 22 matches, with thirteen more wins and only nine draws. But remarkably, when that record string ended with a loss to Raith Rovers on 2 April 2011, Dundee were still in seventh place (and had even dropped down to 10th for a period of eight weeks in the middle of the streak). They finished the season in sixth. On 1 October 1912, a group of friends in Ascunsión founded Cerro Porteño. With 31 league titles, they have become one of Paraguay's most successful clubs. That first meeting was held at the home of Susana Nuñez, mother of one of the players. They chose the name "Cerro Porteño" after the nearby location of a famous battle where, in 1811, Paraguayan soldiers held off an invasion by Argentinian forces. As their colors, they chose red and blue, uniting the colors associated with the country's rival political parties. That choice led to Cerro Porteño becoming known as "the club of the people." They won their first national title in 1913, quickly followed by additional ones in 1915, 1918, and 1919. 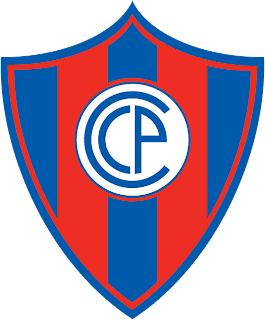 The 1920s passed without silverware, but Cerro Porteño have claimed at least one league title in every decade since. Their most dominant period came in the 1970s, when they won five (1970, 1972, 1973, 1974, and 1977). The club's current total of 31 is second only to Olimpia (40). Their most recent trophy came in 2015, when they won the Apertura by five points over Guaraní.